I was planning to post today with a gift for teachers. My sister shared this idea for a small gift and a sweet way to say "thank you" to your child's teacher. 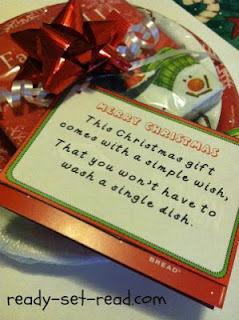 It's a super simple gift and not very expensive, but I thought it was cute. As I was preparing this blog post, the tragic events in Newtown, Connecticut were unfolding yesterday. It reminded me that there is no way to adequately thank the teachers who work long hours educating and caring for our children. While we could buy a more expensive gift for a teacher this year, we could also just take time to tell the educators in our child's life "thank you" whether in a handwritten note or verbally. This simple gift does not convey how much we appreciate our teachers, it is just a small gift given to help a teacher relax over the holiday break. I've created a free printable that you can use to make this teacher gift. To make this super simple gift for a teacher, find some cute holiday paper products-- plates, napkins, even cups could be cute. 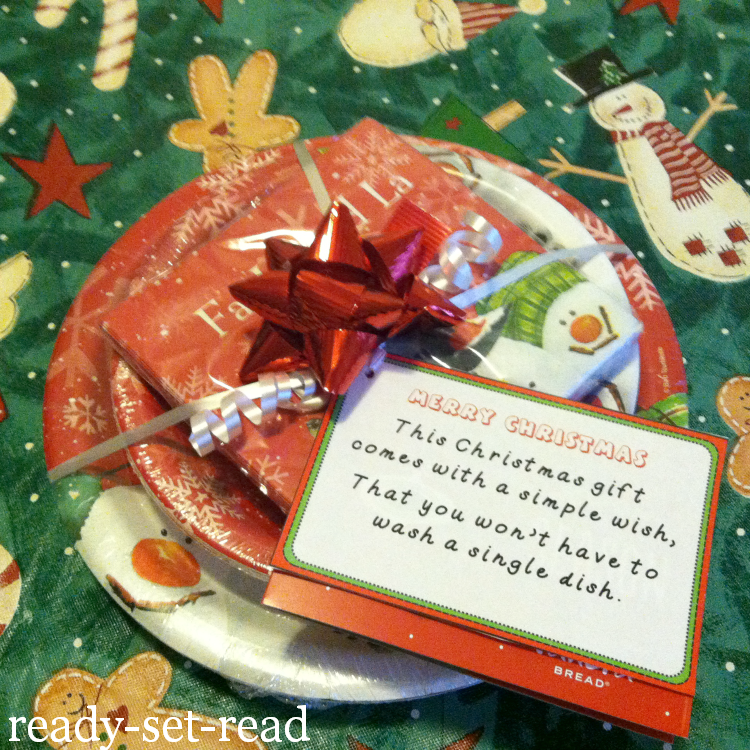 "This Christmas gift comes with a simple wish, that you won't have to wash a single dish." 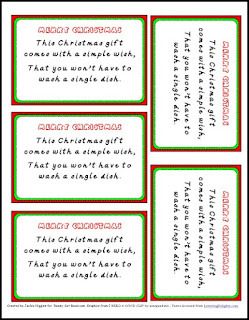 Here's a free printable with the gift tags. You can get it by clicking on the picture below. I also attached a gift card to a restaurant that I knew the teacher enjoyed. Yesterday I posted a quote from Mr. Rodgers on my facebook page. "When I was a boy and I would see scary things in the news, my mother would say, 'Look for the helpers. You will always find people who are helping.' To this day, especially in times of disaster, I remember my mother’s words, and I am always comforted by realizing that there are still so many helpers--so many caring people in this world." Many of the helpers that I saw in the tragedy at Sandy Hook Elementary School yesterday were educators. Our hearts are with that community as we say thank you to all who helped, both educators and so many people who serve and protect every day. We pray for the families who have lost so much. You said this so well. What timing. Teachers often have little time to shop or bake, and the do dishes, too. This is such a perfect gift. I will be pinning this. This is a beautiful gift! Our teacher is outstanding, we are so blessed to have her in our daughter's life!